Innovation is like a game of telephone. Someone creates a message, but as it spreads, it loses its meaning. Lessons that seemed clear back in the first-person shooter’s formative years became taken for granted and eventually forgotten. Shooters today are all about weapon limits, level design set pieces, and regenerating health. Doom’s return in 2016 was like finally hearing those original lessons with startling clarity. Its immaculate design is a defiant reminder of the strength of classic shooter design. Every game designer should live by Hamlet’s immortal line: “Brevity is the soul of wit.” Unfortunately, players could sit through an entire production of Hamlet before most games actually give them the reins. The new Doom, in contrast, is the epitome of game design wit. You wake up chained to a table, with monsters about to attack you. You’re killing monsters in the first 30 seconds. You have your shotgun within the first two minutes. One of Doom’s first and most important lessons is that close-range combat is fun. Most weapons have relatively short range, and most enemies are happy to rush the player. This is partly because Doom wants to be an intense game, and one of the best ways to make a game intense is to keep things nice and close. When you snipe an enemy and he falls to the ground, it’s fun, but when you blast him into meaty chunks with your shotgun, it feels a heck of a lot more exciting. The new Doom is the epitome of game design wit...You’re killing monsters in the first 30 seconds. You have your shotgun within the first two minutes. Back when I raided in Destiny, a lot of raid crews liked to deal with many encounters using sniper rifles at long range. This was nice and relaxing, because there was no risk involved; if an enemy started shooting, just step back a few feet, wait for it to stop, and step forward again. This kind of behavior isn’t possible in Doom. The level design and weapon range don’t allow for it. One key to keeping things close is the finisher system. The original Doom didn’t have finishers. 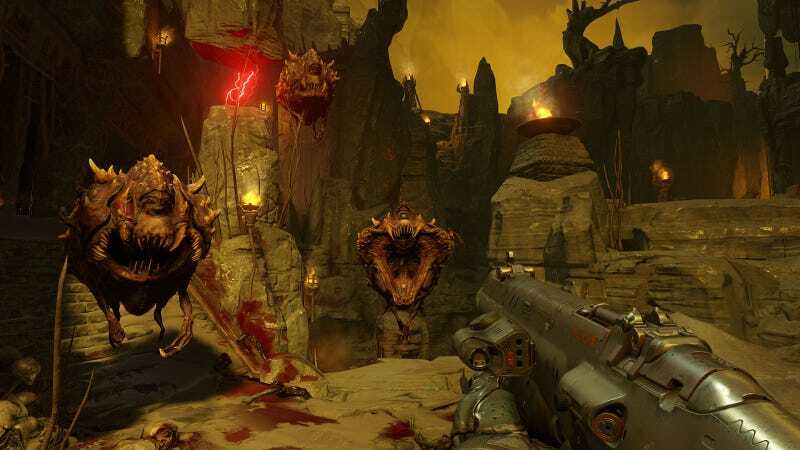 Fans complained when they saw them in the new Doom, and with good reason. In games like Deus Ex: Mankind Divided, the screen fades to black, a cutscene plays where the player knocks out a bad guy, and then the screen fades to black again and you’re back in control. It’s awkward, lengthy, and weird, pulling you out of the character’s head for no reason and disrupting the game flow. Not just for show. The game’s brutal kills, available once an enemy is staggered, are the best way to get health, encouraging players to rush into battle rather than to stay at range or behind cover. Doom is much better. Its finishers are quick, rarely lasting more than a second or two, and they’re completely seamless, keeping you in Doomguy’s head. More importantly, the finishers are integral to the gameplay. Doom doesn’t want you holding back, waiting for enemies to come to you. Breaking enemies open like gory piñatas is the best way to replenish your supplies. This leads to more exciting encounters and more risk taking. Say you’ve got 10 health left. In a game with regenerating health, all you have to do is slow down and wait for your health to return. This lessens the intensity of the game, reducing the options for risks and rewards. Given Doom’s classical health system, the player needs to pick up health kits in order to heal. With the finisher system, the best option is to charge into the fray, tearing demons limb from limb until their corpses yield enough health supplies to continue. A more modern health system would be a lot less fun. In most modern shooters, you can only carry a handful of weapons. However, it’s easy to find ammo, and almost every enemy drops weapons. This kind of design can be great. Halo: Combat Evolved uses its two-weapon limit to ensure that players who run out of ammo for one gun type have to pick up different guns every few minutes, keeping the combat experience varied. Unfortunately, most modern shooters aren’t like that. Pick up one machine gun, and you’ll never have to switch it for something else. A shooter you need to explore? Go figure. Doom lets you carry everything, but you can’t pick up ammo from your enemies unless you use a finisher to tear them apart, and it might not be enough ammo to see you through an entire combat encounter. If you want ammo, you’ll have to go exploring. Shooters really start to shine when they encourage players to think about the combat space. By having an old-school approach to ammo, where you have to find ammo crates for each weapon type, Doom players must always be on the prowl. Instead of walking from gunfight to gunfight, you have to be on the lookout for useful supplies that give you an edge in combat. One of the biggest weakness a shooter faces is that games have taught players to take the path of least resistance. This is rarely the path of the most fun. Doom remedies this with its weapon upgrade system. Each weapon has multiple upgrades that drastically change the player’s playstyle. The rocket launcher, for example, can either lock onto enemies or be manually detonated in the air. Manual detonation is great for killing groups of enemies, while lock-on is useful for tangling with some of the more mobile foes. To complete each upgrade tree, players must approach the game in certain ways, killing specific enemies with specific fire modes. I’ve seen some games try to punish players into varied play. Doom wisely dangles the carrot of upgrades instead. Doom players must always be on the prowl. Instead of walking from gunfight to gunfight, you have to be on the lookout for useful supplies that give you an edge in combat. The cherry on top of Doom’s ice cream combat sundae is its emphasis on movement. Close range encounters, level design that encourages climbing, and enemies who rush the player or fire projectiles the player can dodge all push the player to move around the space. 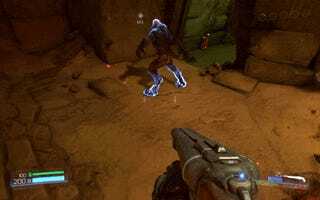 You can judge a shooter entirely on its movement mechanics, and Doom excels at this. Doom is a game where every design decision is relevant to the player’s experience. It’s a game that’s acutely aware that players want to play. Instead of doing what’s popular because other games are doing it, Doom returned to the fundamentals of good shooter play, then innovated on that. It’s a breakthrough. The Remarkable Achievements Of A Game Called F.E.A.R.